I grew up in the late 50's and 60's in SE Pennsylvania at the fringes of Amish country. It was a rare sight to see an Amish horse and buggy in those days. Last week, on a beautiful autumn Sunday, driving a seven mile stretch of PA 372 southwest of Lancaster, heading to a hike of the Mason-Dixon Trail, I lost count after passing more than two dozen buggies. It was probably visiting Sunday, not a church Sunday. I could not have reached that conclusion had I not just finished reading Donald Kraybill's comprehensive documentary about the enigmatic ways of the Amish people. I had been away from the area for fifty years and just recently returned to help my Mom and Dad during and after my Dad's final illness. The Amish population had multiplied seven-fold in those years. With such a significant presence around me, I thought it would be worthwhile to read up on these people in order to get a quick education on 'what makes them tick'. Kraybill's book was recommended, by name, within the fictional text of 'The Atonement' by Beverly Lewis, a novel about an Amish woman with a secret past (see the review below). The book has wonderfully filled many of the gaps in my understanding. It is a comprehensive resource, and I recommend it. What this book will not do is give you any understanding about what it feels like to be Amish, or what their day-to-day life is like. For that I believe Lewis's 'The Atonement' provided a good glimpse. What Kraybill's book does is provide an academician's clinical, scholarly perspective on the culture and beliefs of this sect that has successfully remained separate from the American mainstream but yet has managed to integrate smoothly into the greater society whose values it largely rejects. Kraybill's main purpose seems to be to explain how the Amish have managed to do that, how they have maintained a viable community on their own terms despite prohibiting education beyond the 8th grade, despite avoiding owning automobiles, despite prohibiting electricity in their homes, and despite becoming a major tourist attraction for the region. In a nutshell, the Amish do change and adapt to changing times and technology. While hiking I would frequently see Amish in their farm fields pulling modern farm implements with draft horses, as many as six and eight. The wheels on those implements are always steel, not rubber. I could clearly hear the sound of a gasoline engine, mounted on the implement, operating the machinery. When driving past an Amish farm there are no electric wires running from power poles on the street, but their pastures are encircled with electric fences. Propane tanks are prominent beside the large, neat homes. And I frequently would hear the sound of a large generator humming beside the barn. The changes to the Amish 'Ordnung,' their strict oral code of conduct, are selective, slow to evolve, and made to balance their deeply ingrained 'Gelassenheit' (humility), their mandate to separate themselves from modern ways, and their literal interpretation of biblical canon, with the practical reality that they need to make a living. I won't provide 'spoilers' by explaining further. Suffice it to say that Kraybill manages to very successfully 'crack the code' or solve the Riddle. The book is a 2001 update of the original 1989 volume. It is about time for another update. Though the Amish seem to be thriving, the Lancaster settlement continues to face challenges, not the least of which is their burgeoning, indeed exploding, population. The average Amish family has six to eight children. Their population doubles with each new generation. All these new 'plain folk' need to make a living. Traditionally they were farmers, but God's not making more land, and suburban development around Lancaster is raising land values and turning farm land into housing subdivisions. Bottom line: The fate of the Amish Culture remains uncertain. Their story is an ongoing, dynamic one, and it's fascinating. They are adapting to the twenty-first century in some surprising ways, and Kraybill provides an excellent guide to understanding these sometimes enigmatic practices. His 2001 edition remains relevant and highly informative, but for how much longer? Lucy Flaud is Old Order Amish from Lancaster County PA. She is single and 25, almost too old to marry, and she holds no hope of ever finding love. She harbors a deep secret so shameful that she does all she can to avoid thinking about it. What she knows is that this secret disqualifies her from ever being worthy of happiness. She has not taken communion for nearly a year. When her long time close friend Toby asks to court her, she refuses, both in person and in writing. We learn that Lucy's shameful past involves a relationship with an 'Englisher,' a worldly outsider. That relationship is over but now she seems to be getting dangerously familiar with another outsider. As the story unfolds we follow Lucy's frantic attempts to drown her painful memories in selfless volunteer service, yet events keep prying open her self-imposed seal on the subject of her past. 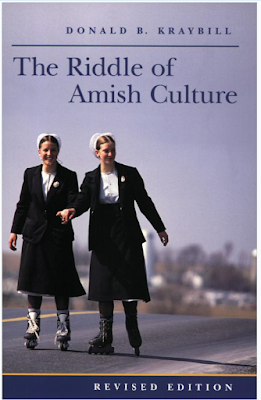 Author Beverly Lewis has written dozens of novels describing various facets of Amish life. I cannot say from personal experience whether her characters and their actions and their language are true to form but they certainly appear to reflect the self-effacing 'Gelassenheit' mindset that dominates Amish culture, their heavy emphasis on family bonds, their mistrust of the ways of the outside world, their unshakable work ethic, and their humble, abiding Christian faith. I picked up this book because I'm currently living in and hiking through the sprawling Lancaster Settlement and wanted to begin to explore the culture of these distinctive people. Regardless of whether Lewis is faithfully depicting the culture, her story is a page-turner. I thoroughly enjoyed it. I recommend it without qualification and hope to read more of her work.